This part of the series has just been picked up commercially so hopefully we'll get to see the whole series soon. I've finally seen the whole series! Saber Marionette JtoX is the newest TV series. It starts with Bloodberry and Lime going to work (Cherry stays home and does the domestic stuff). The Saberdolls have moved out and now have their own fast food place. Marine does not reappear and Lorelei says that Lime has a gap in her memory. In this series, the marionettes have already developed their emotions. Now they have to learn to deal with their emotions and find where they fit in society. This is the major plot of the series. The first few episodes are really serious, but you'll find that they all come together in the end. 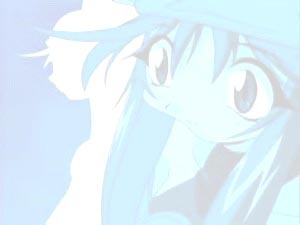 Towards the end of the series, the characters (from Lorelei, Tiger, Hanagata, and the other main characters) look back and their experiences and their mistakes. It really addresses the "what now" after a person becomes a hero and it also addresses what it means to be "human." They must learn to understand and control their emotions. They start off quickly by competing for Otaru (as usual). It doesn't take long for them to realize that they have to deal with their growing emotions. Lime begins to wonder what place they have in society. She feels that they were built for war and that people only see them as destroyers. Bloodberry and Cherry are confused because Lime keeps all of this to herself. Otaru finally finds her sleeping next to the marionette monument and lets her know that she is a person like anyone else. He also lets her know that she will not be forgotten and that he will always treasure each of them. Bloodberry and Cherry help to comfort her and also find comfort in Otaru's words. Bloodberry learns more about her emotions and feels like she is just a child inside. She plans a date with Otaru, but Otaru decides to let Lime tag along. Bloodberry naturally gets mad and walks off. Bloodberry decides not to let her whole day be ruined, so she stops by the circus. There she meets a young man named Akashi who looks a lot like Otaru. He immediately gives her all the attention she wants and is very nice to her. Akashi's partner is hurt during practice and Bloodberry volunteers to take part in the tightrope routine. Akashi pushes her hard, but gives her lots of praise when she does something right. Bloodberry learns that her emotions make it harder for her to concentrate, balance, and time things. She soon starts feeling guilty about her feelings for Akashi. She also realizes that even though Otaru and Akashi look similar, their personalities are nothing alike. Akashi asks Bloodberry to leave Otaru and travel with the circus. Otaru shows up and sees Bloodberry's tightrope act. That night Bloodberry curls up helplessly and ponders what to do. Bloodberry decides to follow what she thinks is right. Lime has another learning experience. Bloodberry and Cherry have maintenance problems and have to stay with Lorelei for awhile. Lime and Yumeji go out to play with the kopontas and a fairy guides Lime to rescue a koponta that was in danger. Lime goes back to Lorelei and tells Lorelei about the fairy. She says that only people with innocent hearts can see them. Lorelei wonders how a marionette could see a fairy and what happened to some of Lime's memories. Lorelei decides that the fairy must be an old game that was programmed into Lime a long time ago. Lime and the fairy (Lido) become fast friends. Lido fads away and Lime looks all over Japoness for her. This confuses Otaru to no end. Lime runs off to the lake where Lido liked to play and sang Lido's song. Lime finds a box with a hologram of Lido in it just before the batteries run out. A young boy shows up and gets the box from Lime. Otaru says that he would like to think that the box was some sort of communication tool. Cherry also has her own major event early on. She finds a baby male clone by the river. She hides it away and takes care of it when no one is looking. There is a huge search for the missing clone, but none of the searchers know what a baby looks like. This help Cherry to hide the baby for even longer. Tomasaboro and Baiko soon realize that Cherry must be the one to have the baby and start an all out search (battle) to find her. They start their search by hanging upside down outside of Otaru's window. Cherry is determined not to give up the baby she has named Kotaru (ko means little and the rest is well, Otaru, so it means "little Otaru"). When Otaru finds out the name he is extremely embarrassed. Bloodberry tries to fight Cherry because marionettes can never have children. Lime cries because she doesn't understand why they have to fight each other. The battle never really starts, because Kotaru starts crying and Cherry tends to his needs in a way that shocks everyone. Lorelei lets Cherry be Kotaru's mother for the night. Another good episode is when Cherry and Bloodberry stick up for Lime because they realize that no one is listening to her.